Check out the other entries at Macro Monday. This is a very interesting plant. Did you see it consuming any creatures? Its kinda strange plant and by just looking at the picture, I may conclude that it doesn't smells good. :D Maybe its not on its full bloom on the day you saw it. Anyway, thank you so much for always visiting my blog. Deep inside, I really appreciated every single comment you left in my blog. From the very start you are still my Top Commentator and I can say that "I owe you heaps!" What an exotic looking flower, and great macro shots! That is a fascinating plant. 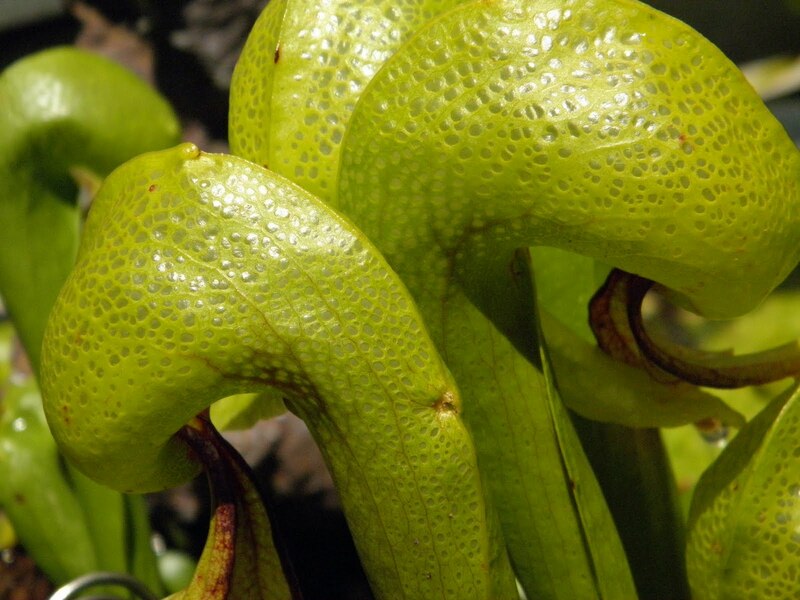 I was watching a program on tv one time that was all about carnivorous plants and this was one of the ones they showed. carnivorous plants are sooooo cool! I would love to be able to find one of these growing in its native habitat - I think they are such interesting plants to grow and study. Joanne great shots. I think you'll be back there again to take some more photos of it. A very fascinating and interesting plant that is. A great super macro shot. Happy Monday! What an interesting plant. Thank you for sharing. Cool macro shots Jo! 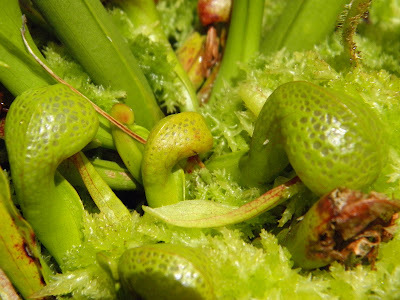 The pitcher plant is our provincial flower - however, ours are more red than green... they grow wild here on the bogs. I think I'll go for a walk and find one to photograph! Very interesting plant. Nice shots! That plant is surely interesting with its curls and forms. Great macros too Joanne. Unusual plant and a good lesson for me today. I didn't know about it. Something about these plants make you feel crawly and disgusted. You've captured both their interesting shapes and their creepiness. Very cool macro shots, I have always been fascinated by carnivorous plants. I would love to try to grow one of these. I really like the detail in your first photo. Hello all, I am having an issue with error messages from Blogger on comments today so I am just going to say thank you all for visiting and commenting. I appreciate you all so much. What a unique plant! So cool. Good for you for having your camera with. I love the vivid green. I love pitcher plants! Very nice find! I don't know why, but as soon as I saw the pictures I thought of danger. Then after another part of that first second I saw the title. You captured the nature of this plant very well. I really like carnivorous plants. I have never seen such a plant ! Could have snapped your finger right off!!! Thank you all so much for stopping by. I am always excited to read all of your thoughts and comments as they are very much appreciated.